Effective leaders know that no important business decision is made in a vacuum. Critical decisions that affect the well-being of your company call for extra thought and consideration, and for the small-business owner, this task is a vital one because it affects your future and that of your employees. Such decisions require that leaders ask specific questions of themselves and others, says Roxi Hewertson, CEO of Highland Consulting Group Inc. and AskRoxi.com. “Not asking pertinent questions or gathering critical information is an incredibly myopic way to make a decision,” Hewertson says. For more than 20 years, Hewertson has worked with business owners, helping them more effectively lead. She says that failure to make good decisions is a common problem. You can increase the odds that you’ll make more effective decisions by first asking yourself these five questions. If, for instance, you know you need to decrease expenses in order to remain profitable and a decision regarding this issue is necessary, it’s important to know exactly what that decision is. Does it mean you need to downsize staff? Institute a hiring freeze? Cut employee benefits? 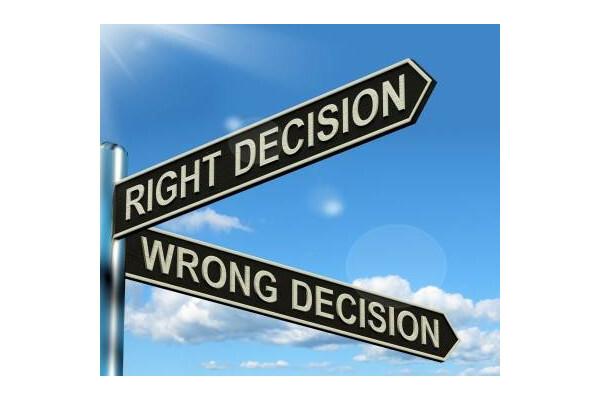 Narrowing down the decision you need to make enables you to make a sound one. 2. Whose decision is it? It’s critical that you know and communicate up front exactly who will make the decision, Hewertson says. “Are you the decision maker?,” she asks. “Or is this a group decision that you will not override? Do you want input or a decision from others? Or is the decision someone else’s outside your group? For employees to become invested in whatever decision you make, it’s important that they feel respected and consulted, agrees Deborah C. Hoard, president ofPhotoSynthesis Productions, an award-winning, small, independent video and film production house in upstate New York. “Being perfectly clear on who the decision makers are is crucial,” Hoard says. Knowing who the decision makers are also makes it clear which method you should choose, such as consensus, majority or unanimous.